When attendees/exhibitors reserve rooms at hotels "outside" of our block or through internet providers, ACNM is exposed to penalties for not fulfilling our room block commitments, we risk our ability to rebook preferred meeting hotels and receive reduced rates, possibly lose qualification for the amount of space needed at the convention center and/or hotel and are subject to higher meeting space usage fees. This in turn could translate to higher registration fees. In addition, when attendees/exhibitors do not use the official ACNM Hotels, we are unable to assist in the event that the hotel "oversells" its room inventory or if there are security or other issues during your stay at the non-official hotel. In addition, those staying at outside hotels miss out on meeting communications via the door drops, front desk, and in room TV. 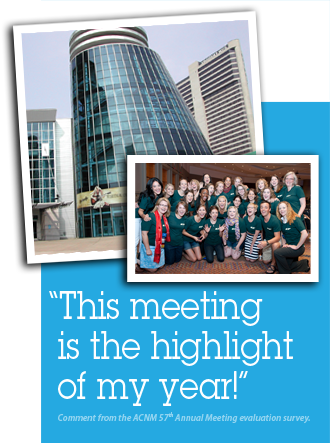 Help ACNM make this meeting a success! Remember to book early and only use the official meeting hotels.